Seeds germinate not just random. Starting in the winter or in a dry period is unlikely. Others survive just by specializing in survival when and where the competition cannot. There are seeds that have to ripen first. Others have a thick or tough seed coat, which requires months to soak and rupturing. 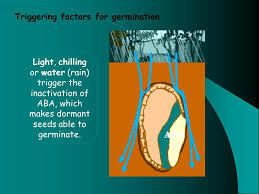 Still other types have germ inhibitors in the seed coat which gradually dissolve. Or have to be gnawed or sanded. With stratification is meant a structure (or building) designed in layers. Some seeds layers need to be affected to start germination. If this is done by cold, we call it cold stratification. The damage to the seed coat is not only be done mechanically by sanding or filing, after which the seed can absorb water. It may also be through passage of the gastro - intestinal tract of animals, such as birds. Thus, each grain is a complex chemical laboratory. Nature provides mechanisms adapted to germinate at the most appropriate time and grow. Especially temperature, time, water, and light play an important role. When only one special treatment is needed (usually stratification), we call it simple dormancy. Some seeds need more than one treatment to get started: a double dormancy. As some Ilex, Taxus, Lilies and Tree Peonies need a warm period (20-30°C) of three months in which the root develops, followed by stratification for one to three months which triggers stem development, before emergence of the growing tip will occur. Some seeds may continue to rest a long time viable in the soil. Once the ground is borrowed or plowed, they come to the surface and begin to germinate by the influence of light. Some seeds need only a thousandth of a second light to start the germination process. The "seed apples" of Sequoia only opens when they are located in a fire. Seeds that need light to germinate we can call light starters. They are on the seeding (almost) not covered with earth. Grass seed is a light starter, and you may not rake it deeper than about 1 cm. Tobacco will only germinate if the seeds are constantly in view. A lot of small-seeded annuals have light-requiring seeds. It prevents germination when they are buried too deep in the soil. They are likely to use up their food reserves and die before they reach the soil surface. It also prevents them from germinating when it’s too shady by surrounding plants that compete for sunlight. Known light starters are e.g. strawberry (when sown), savory, celosia, chamomile, lettuce, celery (bleach celery, celeriac, cut celery), stevia (sweet leaf) and parsley. Lamb's Quarters is a light impulse starter. Other types include ’dark' starters. They must therefore be covered (e.g. with sand). Some seeds need combinations of stimuli. Some seeds germinate only at a certain temperature. Others need a certain amount of cold in order to germinate, they need verbalization (influence by cold). If you do not know whether some seeds need a cold period, divide the seeds into two groups. Sow half in the fall and the other half in the spring and thus spread the risk.